Stove side of tiled kitchen. Middle staircase bedroom with queen bed. Back to main floor: 6th bedroom, no stairs. New patio built in 2016. Beds: 4 queens, 8 twins, daybed in den. 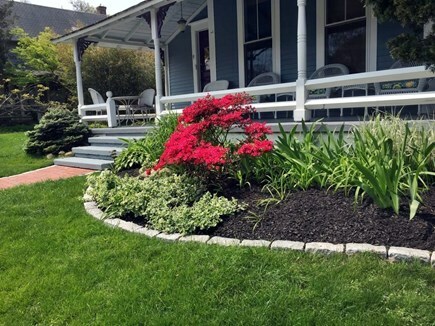 Keep the car in the driveway and step to all that Oak Bluffs has to offer in this sparkling Victorian home, located in the heart of the historic Copeland district (just steps to both town and beach). Enjoy the outdoor areas, including a hard stone patio, tables and seating, and attractive landscaping. Beyond that, we will let the photos do the talking, but note that this home has some especially attractive features for large groups, such as bedrooms that allow for privacy due to access by 3 separate staircases -- and a kitchen area that has two refrigerators and two high efficiency clothes washers and dryers. Dining area has two tables that seat up to 16 people. There are a number of flat screen TV throughout the house. Mattresses and pillows are all protected with hypoallergenic liners. 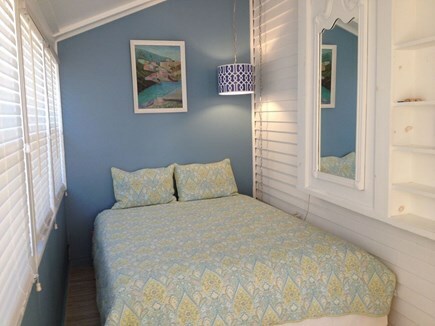 With all that is new, there are still many historic touches that have been restored -- sliding panel doors with the original hardware in the living room, stained and leaded glass windows, and a funky 'Nantucket Bedroom' that is great for kids. Outside you will find a large, shaded farmers porch, outdoor shower, gas grill, and a more private sitting area on the side of the house. Cross the street and you have access to a playground and tennis/basketball courts (we supply high quality tennis rackets and basketballs). Take a few more steps and you are on Circuit Ave, surrounded by restaurants, shops, and nightlife. As for the beach and harbor (including ferry boats to the mainland), they are just a few scenic blocks away. This home is professionally cleaned and maintained year-round, and the owner has been renting out homes on the Vineyard for over 15 years. 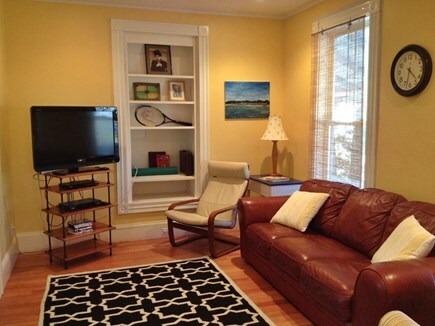 Feel free to inquire about the two bedroom Edgartown home, id 12642. Additional availability info: Contact owner for off-season and any weeks with no price listed. This is a Sunday to Sunday vacation rental. 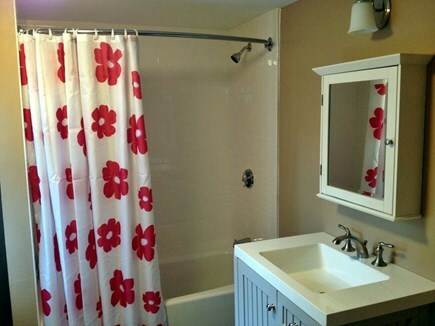 Additional pricing info: $200 cleaning and linen fee, State and local taxes of 11.7% will apply. We LOVED this house!! Can't wait to return to our Vineyard home! This house was meant to be for my group of 14 and it was the perfect fit! 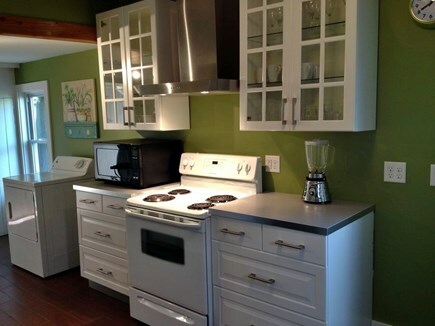 This was not my first time to MVY, but my first time renting a house through VRBO and I was nervous to say the least! I had planned a trip for 18-20 people and our first house was a no go due to drop off. It is hard to find an affordable house for an unusual number of people (13-14) only a week or two away from travel. 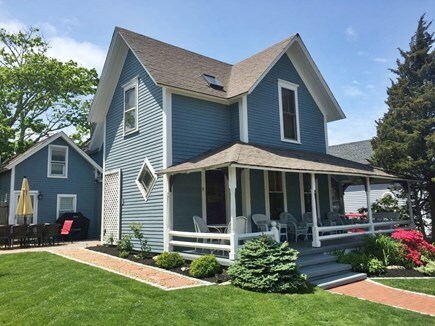 Luckily, I saw the great reviews for this beautiful blue house and reached out to the owner, who was so accommodating and prompt with responses. Joe was definitely a delight to work with from start to finish, giving helpful suggestions for travel and once I received the contract I knew that I had made the right choice! I cannot express enough how perfectly this house is located. Circuit Avenue, with all of the shops, nightlife and restaurants, is literally at the corner and one short block into the scene, but the house is tucked away on its block so you still have peace and quiet. 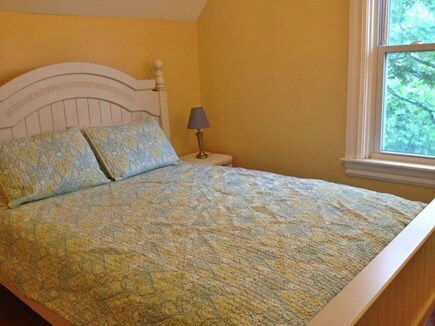 The house is also a five minute walk to the water/beach and maybe a short 10 minute walk to the Ferry. We didn't need a car to get around. My group rented bikes to visit Vineyard Haven and Edgartown and simply walked into town for shopping. The pictures do not do this house justice at all!! It is absolutely beautiful and well laid out. The huge porch has enough seating for 10 people. We watched the Blood Moon rising on the porch with wine and dinner and a beautiful view. There is a grassy park across from the house as well as a tennis and basketball court. 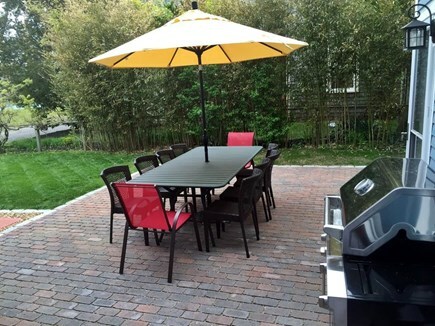 The side of the house has a high quality gas grill and picnic table perfect for a bbq. There are three different staircases from the main floor leading to the comfortable bedrooms and it is such a pleasant surprise. 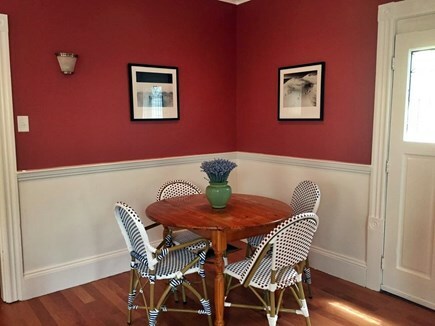 All the rooms in this house are tastefully decorated with inviting colors. The bedroom on the main floor is my fav. It truly felt like home. We will DEFINITELY rent here again! Just finished a three night stay at this home with 12 people (10 adults - 40's-50's, and 2 tweens). I would have to work hard to come up with a complaint! This group has rented many homes on the island over the past 20 years and this one has risen the ranks of absolute favorites. - multiple "wings" for sleeping; people really could have a little bit of privacy away from the big group. - 2 fridges: One for food, one for adult beverages! Brilliant! 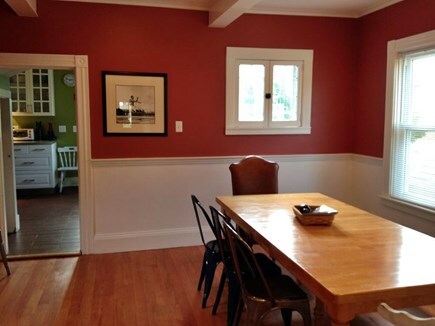 - the home is decorated beautifully, great colors on the wall, feels very homey. This house really LOOKS like the pictures! - the house was clean, well taken care of, and the owner obviously spends the off season investing money and elbow grease to get it in shape. - the location is great -- very close to circuit ave and all the great shopping and eating that OB has to offer, the beach, and, of course, to Back Door Donuts. You really don't need a car to enjoy a great weekend here. Finally, the owner was very collaborative with communication as the trip came upon us, and was SUPER responsive to any of my questions. He was a real joy to work with! Just returned from a fantastic one-week vacation on the vineyard at this beautiful house. 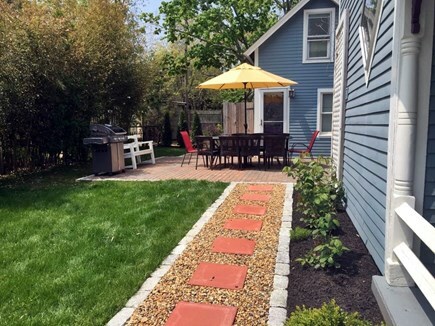 The location is absolutely perfect—less than one block from Circuit Ave. (restaurants, arcade, ice cream, boutique stores, grocery store), a minute away from a playground, basketball and tennis courts and a few blocks away from the beach. We rented this house with another family (six kids under 7) and loved the convenience of walking everywhere. The unique layout of the house is perfect for large groups. There are three separate staircases: first leading to two spacious rooms; second leading to two other spacious rooms and the third (off of the kitchen) leading to one very large room with three twin beds. There is also an additional room on the ground floor. At first, we thought the layout would be difficult with the kids and the stairs, but it turned out to be perfect. 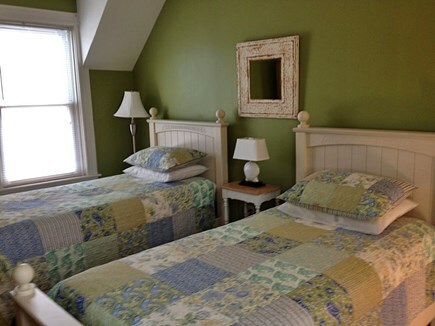 Each family took the staircases with the two rooms each and our two nieces (babysitters for the week) took the one larger room with three twin beds. It was so easy to put the kids to bed and enjoy dinner outside or inside without worrying that the kids would wake up. We loved the wrap-around porch, having the two refrigerators, outside shower and more than ample dining space indoor or outdoors. We were worried about how hot it would be at night and were pleasantly surprised to find up to two fans in every room (even though it got cool in the mornings). As great as the house was, we were so impressed with the owner of the home. 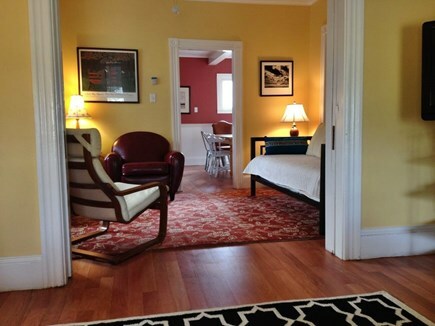 From the minute we inquired about the house he has been nothing but wonderfully responsive. The days leading up to the rental date, he emailed us a long list of restaurant recommendations. We arrived a bit earlier than expected and called him and he picked up right away and told us we could probably check in a bit earlier. Two days into our vacation, one of our kids decided to press all the buttons on the remote control and messed up the television. I emailed the owner and he responded within minutes and explained what we should do. Celebrated my 40th birthday with friends and family in this house and everyone loved it. 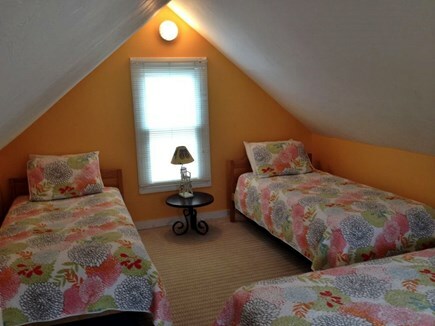 The house is located a block from Circuit Avenue shops and restaurant, which the adults will love. It is also adjacent to a lovely park and tennis club, which the kids will love. The beach is a short stroll away and the neighborhood is lovely. The house is nicely updated with a sweet front porch, small yard with benches and a grill. 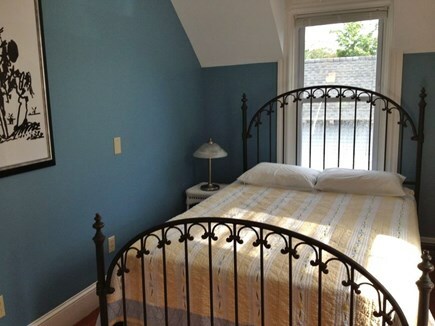 The inside of the house is very clean and well-maintained. 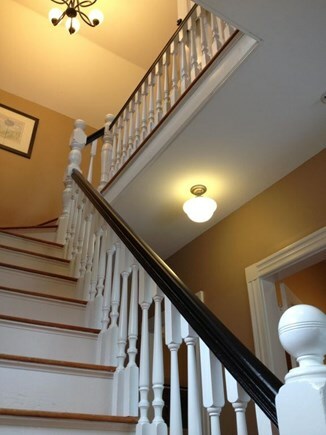 The layout is unique with 3 separate staircases leading to the bedrooms which is great for privacy. 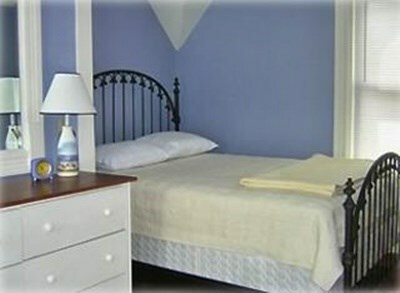 The bedrooms are nicely decorated and family friendly and great for kids. 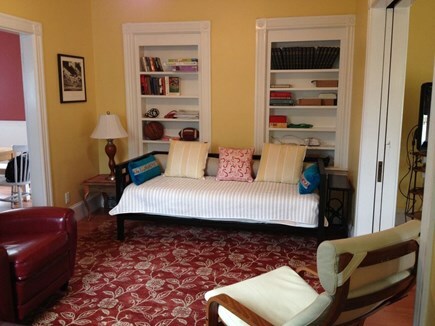 The living room is comfortable with a nice sofa and books and magazines. There is also a computer room with computer and high speed internet. The dining room has two tables, including a large one. 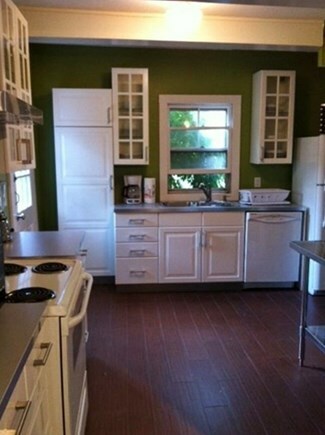 The kitchen has 2 refrigerators and a new washing machine.